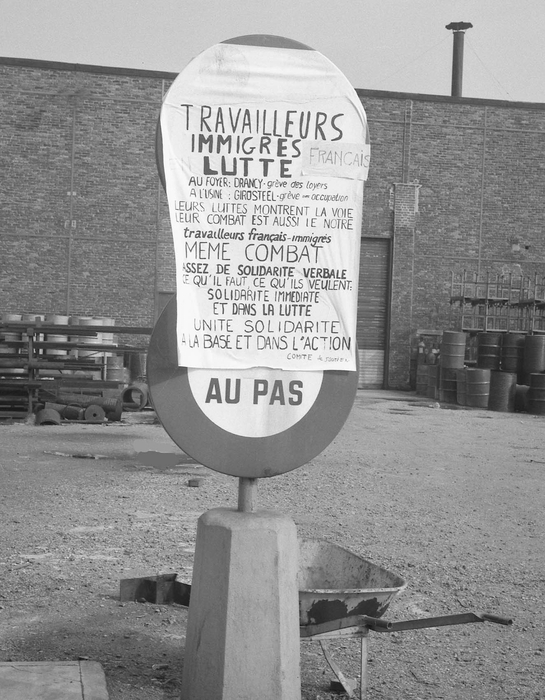 Gérald Bloncourt, Strike and Occupation of the Girosteel plant in Le Bourget, February 24, 1972. A translator’s introduction to this text can be found here. Beforehand, if I may be permitted, I want to commend the quality and political orientation of Bruhat’s piece: defiantly grasping the history of the workers’ movement from the perspective of struggle, he brings us critical information for understanding our present situation more adequately. He offers an exemplary contribution to our ongoing political education by showing us the path of Marxist and Leninist critical analysis and the effective tendencies within the history of the workers’ movement. To return to the question of immigrant workers: Jean Bruhat explicitly limits his factual research to the first (initial) period of the history of industrial capitalism, contemporaneous with the formation of the international workers’ movement. What new forms has this issue assumed since then? We can add several texts to the ones cited by Bruhat, notably those of Lenin. I have quoted the article from Lenin at length in order to better show the twofold problem that immigration primarily poses: the problem of its economic causes and their transformation within the history of capitalism, and its political effects on the proletarian struggle. Lenin’s analysis is all the more timely since it opens up a series of theoretical and practical problems without definitively resolving them. It forces us to consider immigration – the living and working conditions of immigrant workers – starting from the theory of imperialism, outside of which the contemporary forms of immigration remain unintelligible. The concrete knowledge of the causes and effects of immigration is, reciprocally, a guiding thread towards an understanding of imperialism, that is to say, the present stage of capitalism. Jean Bruhat, citing Marx, shows the importance of competition between the workers themselves since the origins of industrial capitalism; but this competition is not a passing or secondary phenomenon, it is the very basis of capitalist relations of production, which oppose the mass of individual laborers, “free” sellers of their labor-power, to the owners of the (increasingly concentrated) means of production. Competition is the basis for the wage as the mode of exploitation of labor-power, and will only disappear with it, through the revolutionary development of new relations of production, communist relations of production. It is true that the forms of this competition are historically transformed: but this transformation is only a substitute for the periodic hiring practices in neighboring countries, where the “national wage rate” is lower, with a more complex “organization” of the labor market, actually international, to be inclined towards some in comparison to others, some against the others, great masses of “skilled” workers, unequal. This transformation is only the very development of capitalist relations of production. It is also true that working-class struggles and the growth of their organizations tend to counteract the effects of competition, and force capital (of which the bourgeoisie is only the instrument) to constantly search for new methods of hiring, selection, labor utilization, new sources of labor-power: that is, precisely, the development of capitalist relations of production is the result of the everyday, ongoing class struggle. It is necessary, however, to go one step further: as Bruhat indicates again, the struggle around the wage (reduction of wages for some, the protection of wages for others) is a primary fact. But this is not all: for the development of capitalist exploitation closely combines pressure on wages, the lengthening of the working day, and the (technological) transformation of the mode of production itself, which makes possible both an increase in the productivity and the intensity of labor. We hit upon here one of the most urgent questions of the present moment: the effects of the permanent “industrial revolution” of capitalism, specifically the labor of OS workers7 in the mechanical and electronics industries. From this point, it is therefore a matter of understanding how the characteristics of imperialism are necessarily reflected at the level of international relations of production: that is, in the immediate process of production, the forms under which capitalism transforms the existing productive forces, and the complex forms of class struggle which are inscribed within the very core of production. Despite the brevity of these remarks, we can now understand the radical political importance of the problem of immigration for the proletariat and its organizations. In the new conditions of our epoch, the presence of immigrant laborers and their struggle render internationalism, more than ever, the very condition of struggles for workers’ liberation, as consistently explained and supported by Marx and Lenin: they claimed that this internationalism always asserts itself through the most concrete, organic means. The futures of workers in all countries depend on it, and henceforth they no can longer fight the same adversary in a merely parallel fashion, everyone for themselves, but must establish everywhere “detachments” of a single, combined, amalgamated force. Thus the development of imperialism leads to a new, higher form of internationalism, and a new stage in the history of the workers’ movement. Moreover, by bringing to our attention the successive forms which make it possible for capital, against workers’ struggles, to foster competition among workers as the basis of their exploitation, the question of immigration shows us why, once again and on a concrete basis, the workers’ movement must lead a constant struggle against the pitfall of economism: giving the trade-unionist struggle its proper and indispensable place, it demonstrates at the same time the absolute necessity of the united political struggle of national and immigrant laborers for socialist revolution, which alone will open the possibility for the destruction of all forms of exploitation. Confronted with the development of struggles led by immigrant workers in their nascent form and with all their difficulties, “left opportunism” wants to see in immigration the “true” proletariat, the realization of a mythical idea of the proletariat: it extols [exalter] the divisions, and reinforces them to the ultimate benefit of capital. On its own side, “right” opportunism denies the reality of these divisions, these contradictions developed by imperialism in the working class itself, either to leave the immigrants to their fate, or to consider that they pose a simple problem of economic, juridical, and social inequality, only calling for the betterment of the lot of the most “disadvantaged.” As for us communists, we see all the better these contradictions right in front of us, in order to identify their objective causes and limits, which every one of our actions seeks to overcome. We know that the entire working class can thus expect a tremendous release of revolutionary energy, a great leap towards its emancipation. This is a translation of “Lénine, les communistes, et l’immigration,” in Cinq études du matérialisme historique (Paris: Maspéro, 1974), 195-201. 1. ↑ Translator’s Note: I was not able to obtain a copy of Bruhat’s letter. In other works, Bruhat focused on the presence of immigrant labor in the initial class struggles in France that broke out with the uneven onset of industrial capitalism in the wake of the French Revolution, when the preservation of guild structures, local traditionalisms, and ideologies concerning the dignity of labor often meant that workers saw resistance against the employment of “foreign” workers as the sole solution to issues of social rights and unemployment. Bruhat cites in his historical studies examples from the 1830s, where engravers, masons, and stone breakers demanded that their bosses not hire workers from other regions or provinces, or even expel them. See Jean Bruhat, Histoire du mouvement ouvrier français (Paris: Éditions sociales, 1952), 223. We also do not have the space to recount the entirety of Bruhat’s (1905-1983) own fascinating personal history here. He was a major intellectual voice within the PCF for some years, a historian who wrote on many topics of French labor history and defended the role of political engagement in the academy. Hailing from a working-class family, he joined the party in the Nantes region all the way back in 1925. He taught at the Lycée Buffon, the Sorbonne, and then Paris VIII-Vincennes. He drafted his first historical article for the Cahiers du bolchevisme in 1933, on the topic of Marx and the Paris Commune, taught extensively at the Party schools and participated in the Cahiers du contre-enseignement prolétarien, and was a frequent contributor to l’Humanité’s “Doctrine et l’histoire” section, which presented the “illustrative function” of historical examples and case studies to elaborate the political line of the party. See on this topic, Marie-Cécile Bouju, “L’Histoire dans la culture militante communiste en France, 1921-1939,” Cahiers du CRHQ (2012): 1-23. Bruhat wrote numerous studies of French working-class life and political radicalism, often for the PCF imprint Editions Sociales: Histoire du mouvement ouvrier français (1952); L’Europe, la France et le mouvement ouvrier en 1848 (1953); a biography of Marx and Engels (1970); a profile of Gracchus Babeuf (1978); a political memoir, Il n’est jamais trop tard (1983); and several co-authored works, including La Commune de 1871 (1970), and histories of trade unions and the First International (1964) as well as the CGT (1958), both of which were written as popular tracts for workers’ education courses. Bruhat’s soutenance for his doctoral thesis was published in a 1971 issue of La Pensée: see Jean Bruhat, “Science historique et action militante,” La Pensée 160 (November-December 1971): 34-43. For more biographical information, see Jean Bouvier’s obituary in the Revue d’Histoire Moderne & Contemporaine: Jean Bouvier, “Nécrologie: Jean Bruhat 1905-1983,” Revue d’Histoire Moderne & Contemporaine 30, no. 2 (1983): 322-323. 2. ↑ Lenin, “Capitalism and Workers’ Immigration,” 457. 3. ↑ V.I. Lenin, “Capitalism and Workers’ Immigration,” in Collected Works, Volume 19: March-December 1913 (Moscow: Progress Publishers, 1963), 454-57. 4. ↑ Lenin, “Capitalism and Workers’ Immigration,” 454. 5. ↑ Lenin, “Capitalism and Workers’ Immigration,” 455. 6. ↑ V.I. Lenin, Imperialism: The Highest Stage of Capitalism: A Popular Outline, in Collected Works, Vol. 22: December 1915-July 1916 (Moscow: Progress Publishers, 1964), 185-304. 7. ↑ TN: OS, or “ouvrier specialisé,” means “semi-skilled” or “unskilled” worker (as opposed to an ouvrier professionalisé) in the leftist discourse of 1970s France this term largely referred to immigrant workers, often various manual labor occupations. 8. ↑ Jacques Frémontier, La forteresse ouvrière. Renault: une enquête à Boulogne-Billancourt chez les ouvriers de la Régie (Paris: Fayard, 1971). 9. ↑ V.I. Lenin, “Revision of the Party Programme,” in Collected Works, Volume 26: September 1917-February 1918 (Moscow: Progress Publishers, 1972), 168. 10. ↑ Karl Marx and Friedrich Engels, The Communist Manifesto, in Marx & Engels Collected Works, Volume 6: Marx and Engels 1845-48 (London: Lawrence & Wishart, 1975), 497.